13 1/2” X 18 5/8” Serigraph poster; historic design & colors. 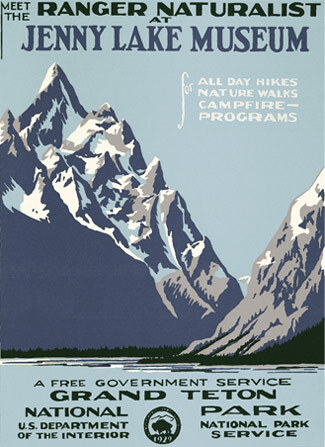 This was the first poster designed by the Federal Poster Project for the national parks; printed in 1938. It is only four colors and artistically unique in that it doesn't carry the Ranger Naturalist Service Banner as do most others. 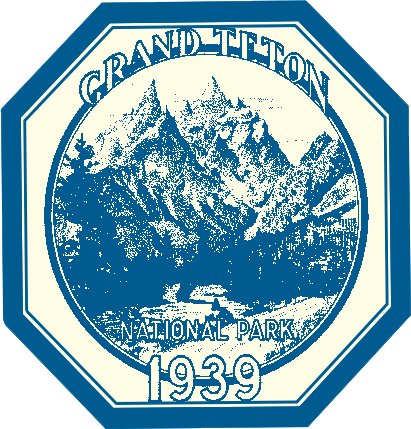 It also has stylized fonts and features the Jenny Lake Museum. An original hangs in that museum today in the summer season. Another in the park archives was found in White Sands National Monument--cut up as coardboard for a plant press! A third is in a private collection.